Two Technologies JETT•RFID+ Hand Held Computer - Two Technologies, Inc. This JETTRFID+ can read tag IDs, read and write data blocks, as well as authenticate and encrypt data to and from compatible tags. These new capabilities allow solutions to support secure storage of information on tags for privacy, security which is required in a number of markets including healthcare, access control, and mobile commerce. Fully supports most popular 13.56MHZ encrypted tags like Mifare® and DESfire. 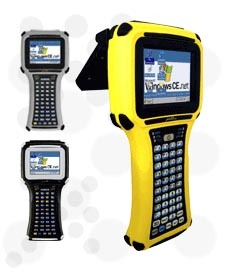 Along with its powerful Microsoft® Windows® CE .NET 4.2 operating system and Intel® XScale® Technology processor, the JETT®RFID features an HF 13.56MHz reader/writer that fully supports ISO 14443A, ISO 14443B, as well as ISO 15693 tags from all major manufacturers. This new mobile computer can read tag IDs, read and write data blocks, as well as authenticate and encrypt data to and from compatible tags. These new capabilities allow solutions to support secure storage of information on tags for privacy, security which is required in a number of markets including healthcare, access control and mobile commerce. An innovative first for the JETTRFID is the future-proof, field upgradeable Software Defined Radio (SDR) architecture. SDR allows for new protocols and tags to be supported by existing hardware as they become available through simple field upgrades. With SDR your investment in the hardware platform is maximized and your risk of obsolescence is greatly minimized as RFID technologies advance.